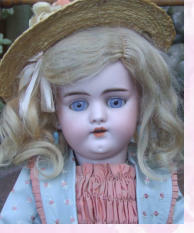 She has a perfect bisque head which is excellent quality and lovely colouring. She has open close eyes with all eye wax intact, and pierced ears. She has her original mohair wig and card pate. Her body is in very reasonable condition with some grubby marks just around the hands and lower arms area. She might have had a couple of fingers glued back on the left hand but it is difficult to tell. She wears a lot of clothing. There is one buckle missing from her shoe. She was bought in Paris, measures 25 inches and dates around 1910.